MANILA, Philippines – The March 2018 civil service exam results (career service examination - paper and pencil test or CSE-PPT) are officially released today, May 16. 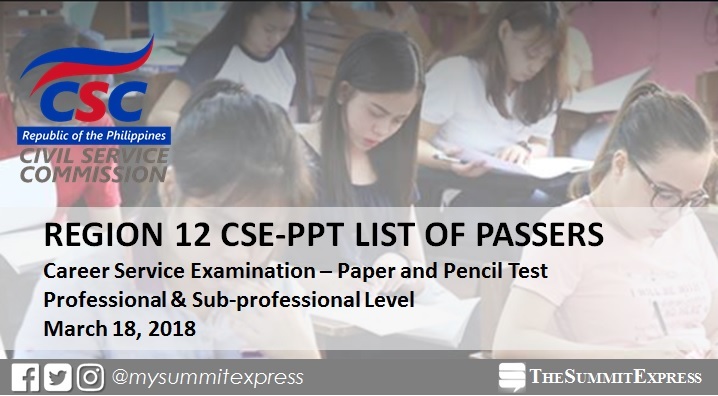 The full list of passers for Region 12 (Soccsksargen) for the professional and sub-professional level exam is now available on this page. Civil Service Commission (CSC) has named 778 passers of the professional level examinations. The Commission conducted the civil service exam on March 18 in at least 61 test centers nationwide. The names of Passers for the first CS examination for this year in Region 12 (Cotabato, Sarangani, South Cotabato, Sultan Kudarat) is posted below. Passing the CSE would result in the conferment of either Sub-professional or Professional eligibility. Sub-professional eligibility is appropriate only to first level (clerical) positions while the latter is appropriate up to second level (technical) positions. Said eligibilities do not apply to positions that involve practice of profession or that are covered by special laws.